1971 Chevrolet C-10 Pickup Mini Web Site - Navigation Page. THIS IS THE SITE NAVIGATION PAGE FOR THE MINI WEB SITE DEVELOPED FOR THIS CUSTOM BUILT AND LOWERED 1971 CHEVROLET C-10 SHORTBED FLEETSIDE PICKUP TRUCK. ALL SECTIONS OF THIS MINI WEB SITE PERTAIN TO THE BUILD PROCESS OF THE C-10 AND INCLUDE DETAILED PHOTOS OF THE VARIOUS ASPECTS OF THE BUILD WITH TEXT DESCRIPTIONS AND TECHNICAL INFORMATION REGARDING THE MODIFICATIONS PERFORMED. Motion n Maneuvering Turning Tight n Solid Fifty Times Ten B4 Redline in 383 STROKER RPM's.
" How's God's Gym ? " FEBRUARY 2007 THE 1971 CHEVROLET C-10 IS READY FOR RE-ASSEMBLY. MARCH 2011 THE 1971 CHEVROLET C-10 IS NEARLY COMPLETE. Ok John, what exactly is a Nevada Weekender ? No simple answer to that question friend, without first having some background knowledge or history. The 383 stroker powerplant to be installed in the 71 came out of Chris's 1968 Chevelle. It is a P.A.W. long block kit that was professionally built : a powerplant that most "gearheads" would agree has too much power for an otherwise stock condition Chevelle, like the one that Chris owned. The Chevelle needed the "normal" stuff, so to speak, installed on it so that such a powerplant could be appreciated : suspension upgrade, cooling system upgrade, brake upgrade, trans, 3rd member and a few odds an ends. His Chevelle was a real nice piece. Straight , well maintained factory paint, complete interior redo. He planned to have me set the Chevelle up for him after he got paid on his next big gig. I gave Chris several different visions of what the Chevelle could be, he liked the street machine vision plan I drew up for it the best [ 12K build fee at the time plus cost on parts required for the build ] although he did like the pro street vision too, i.e., till I gave him the comprehension that those tubs are for mostly 1320 use and not very well adapted to long, high speed, highway runs. The street machine vision was in line with where he wanted to travel in the car. In other words, Chris wanted the car to "road trip" in or a late night run to a Cadillac Jacks type of place in " Tinsel Town ", but he did not want to tear it up by driving it on a daily basis. For a kid who was not even born when the Chevelle was made, he sure had the nostalgia bug bad. He loved driving that car. Long story short : the Chevelle's 383 smoked a head gasket one day. Shortly thereafter, on my recommendation, Chris had a target 350 installed by Chevrolet. I picked up the 383. I told Chris I'd go through the stroker, massage it a bit, as I outlined in the Chevelle's upcoming street machine build, then, that part of the build is done and all I'd have to do is drop it in, and that cuts substantial time off the total duration of the build. As I could only devote two days a week to his build, this meant I'd have the Chevelle for quite some time, and having the powerplant done and ready to drop in would mean he would not be without the Chevelle for as long as I originally estimated. Like I said, Chris loved driving that Chevelle. I said he could reimburse my out-of-pocket for the 383 later when I started the build, when he was deep into the green again, when he does his next gig. Chris was good for the cash, a "kid" still yes, yet, already a man of his word. Anyone who knew him as a friend would agree, of his word, there is no doubt. Like I said, the 383 is a P.A.W. long block kit so it was a relative thumper to begin with. I put $2000.00 grand into the 383 in parts and machine work and made it a heavy thumper [ more on this in the MECHANICAL section ] : and that two grand, my friend, is in late 1990 dollar's, the same parts, the same machine work, would be at least double that today. I don't even want to get started on the issue of how expensive "stuff" is today. Chris, a "kid", yet man of his word, of that there is no doubt. He passed on and I certainly was not going to trouble Helen for my out-of-pocket expenses. I'd rather build something special, something akin to the street machine build I was going to do for Chris and incorporate the stroker within that build. So that's the Reader's Digest version of how I came to own Chris's 1968 Chevelle's 383 cubic inch stroker engine. However at the time I "acquired" Chris's stroker, I did not have a proper vehicle to put the stroker into. Fast forward a few years to the time when my bud Geno was buying a bigger garage [ opps ! I'm sorry Maria, I meant to say house ] and he had to part ways with some of his toys in order to set that bigger garage up like he wanted. 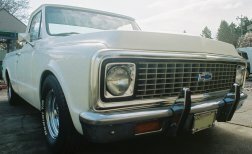 Geno did not want to part with his 1957 Nomad, and I don't blame him a bit, and he just happened to have this 1971 C-10 that he just had professionally lowered 3 and a half inches all round [ C - Notched ] and had a professionally fabricated, mandrel bent, stainless dual exhaust system with Flowmasters installed on the truck. Other than that the truck was a bone stock, and came with a "running fine", 350 / 350 12 inch combo : with no rust, none, nada. Old interior in need of replacement yes, but EVERYTHING was there, untouched by hands having tools in them controlled by a brain that does not know what a decimal or a fraction is. The truck needed a complete re-paint ; oxidation, and with the dollar deal Geno and I made for the truck, I could live with that. It was a fair deal between friends. And that, in brief, is how I came about to own the vehicle the 383 is going into. Now that you, the reader, know the history of this 1971 C-10, I can move on to the concept or intent of this vehicle as a functioning street machine. Click on the nav link 1971 INTERIOR first to begin this journey. Thank you and enjoy the ride.